With a Foreword by Lt.Cdr. J. Locker Madden RN. Rtd. In later life, Nelson was asked to contribute a Brief History of himself to The Naval Chronicle in which he refers to his first service after receiving his commission when he became Second Lieutenant of Lowestoffe under Captain Locker. He goes on to relate his being given his first command – that of a schooner taken as a prize, which Locker had named Little Lucy after his daughter. The two-column coverage of Locker in the DNB shows that he had been a protégé of Admiral Hawke – of whom he became a personal friend, naming his first-born son after him. 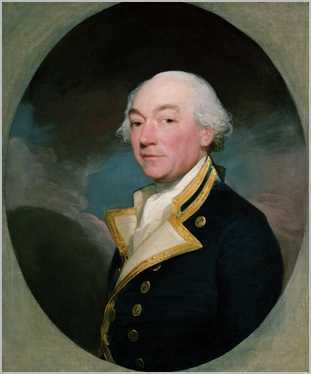 On checking the database at the British Library’s Round Reading Room, the only biographical reference I could find to Locker was the brief narrative by Edward Hawke Locker in his `Lives of Distinguished Naval Commanders’ – with its reference to the fact that it was Locker who had first suggested the establishment of `a gallery of naval pictures at Greenwich’ which Edward Hawke Locker saw into being at the Painted Hall – George IV transferring to it the whole of the naval portraits at Windsor and Hampton Court. It was William Locker who suggested the name of Rigaud as Nelson’s first portraitist – and it was to him that Nelson gave that portrait when it was completed some four years later. There is a fitting coincidence in that Nelson later sat for his finest portrait (that by Lemuel Abbott) in William’s rooms at Greenwich where he had become Lieutenant Governor. The latter portrait was hung adjacent to William Locker’s in the NMM – with a caption beneath Locker’s giving an extract from Nelson’s tribute to him. Locker served under Admirals Hawke, Jervis and Hood with great distinction, and Nelson and he remained lifelong friends. Nelson always regarded William as his `sea-daddy’. They exchanged letters throughout those long years, in which Nelson gave his own interpretations, often politically indiscreet, of events. My book `Nelson’s Locker’ includes more than fifty of Nelson’s letters to William. Early in 1760 Locker was appointed by Hawke to be Lieutenant of the Ramillies 98 guns, commanded by Captain Taylor, but fate intervened in a dramatic way to save his life. Although he travelled down to Plymouth to join her, his commission had not arrived and he was not permitted to board, and the Ramillies went to sea without him. Under the command of Admiral Boscawen in the Royal William, and in company with three other three-decked ships, the Ramillies was working its way down the Channel against a fierce westerly wind, the Admiral being impatient to get on station. However, the wind rose to such a height that the Admiral was forced to abandon the attempt and order his squadron to turn back. The Ramillies became separated from the other ships in thick weather – and in the murky conditions her officers mistook Bolt Head for Ram Head and altered course accordingly. They discovered their mistake too late, and although they quickly let go all anchors they found that the two main cables had crossed, with the result that whilst the anchors briefly held the ship, the strain was too much and the cables snapped under the friction. Since they were drifting on to the lee shore, the order was given to cut away the masts but to no avail – the ship was immediately driven onto the rocks and almost instantaneously was dashed to pieces. Of the crew of 734 souls, only 25 men and a midshipman were saved. A few cameo incidents serve to give a picture of the harrowing scene – the Captain of Marines was seen on the poop-deck in a state of complete insanity, singing and declaiming by turns. The bosun was seen with his little son in his arms, trying to find some space within the rocks; after a long hesitation he was seen to throw the child into the boiling sea and leap in after him – both were instantly dashed to pieces. The few who survived were hauled up the sheer cliff-face by ropes lowered from above; one of them, a fine young man, had already secured the rope to himself when a heavy timber smashed his leg against the rocks, leaving the limb partially severed. The onlookers above saw him deliberately take out his knife, cut his mangled leg free, and then wave to them to haul him up. The stump was tightly bound and later amputated. The man recovered fully, and was afterwards made cook of the Royal George by Sir Edward Hawke. I received this today from Mr Beighton, who says :` this morning I had a most friendly letter from Sir Edward Hawke, and send you a transcript of what relates to William…. his son told me that when he (Sir Edward) heard of the disaster of the Ramillies, amongst other lamentations he said “poor Beighton has been solicitous for his friend Locker, and he, poor man, has shared the unhappy fate”. William Locker married Lucy Parry, the daughter of Admiral William Parry, Vernon’s second-in-command – and granddaughter of Commodore Charles Brown, a Commissioner of the Navy. Their daughter was also named Lucy – and it was in her honour that Nelson’s first prize command was named. Oliver Warner in his `A Portrait of Lord Nelson’, in mentioning Locker, wrote that he was `a robust example of eighteenth-century clarity and assurance. Shrewd, sophisticated, capable and affectionate’.